Available only during the month of September, these exclusive C-size Hello, Life! stamp sets can be purchased for $13.95 each! Or, for an even better deal, you can purchase all three for only $34.95—a savings of $6.90! Each stamp set is designed to fit with a specific type of papercrafting, whether that’s scrapbooking, cardmaking, or pocket scrapbooking. However, all the stamp sets coordinate with each other and can be used together to create dynamic artwork. 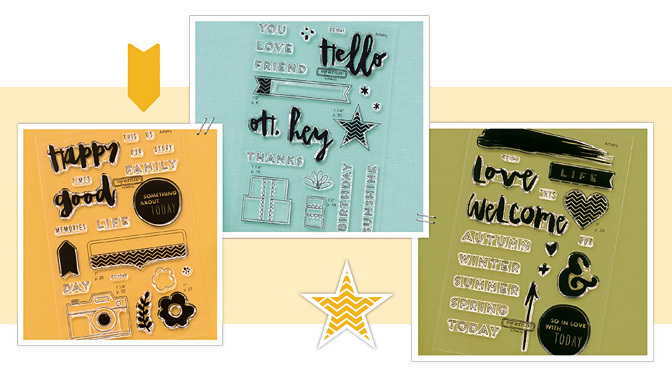 These stamp sets also coordinate with shapes from the new Cricut® Artistry collection to help expand your artwork options even further. Remember, these stamp sets are available for one month only, so get your orders in for one stamp set—or all three—before these gorgeous stamps disappear! Make certain to follow Close To My Heart’s blog, Instagram, and Facebook page for artwork inspiration featuring these lively stamp sets all month long. You can post your own artwork to your social media channels using the hashtag #ctmhHelloLife.